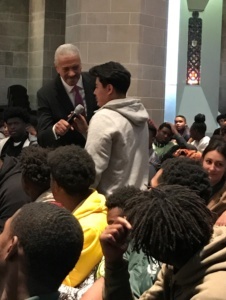 More than 600 students from Detroit Public Schools and other area schools attended a special event sponsored by Catholic Charities of Southeast Michigan, in cooperation with The Sports Marketing Agency and the NFL Alumni Detroit Chapter. 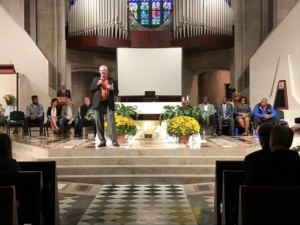 The Sports Impact Luncheon, which took place Tuesday, Oct. 23 at the Cathedral of the Most Blessed Sacrament in Detroit, tackled the tough topic of drug addiction. 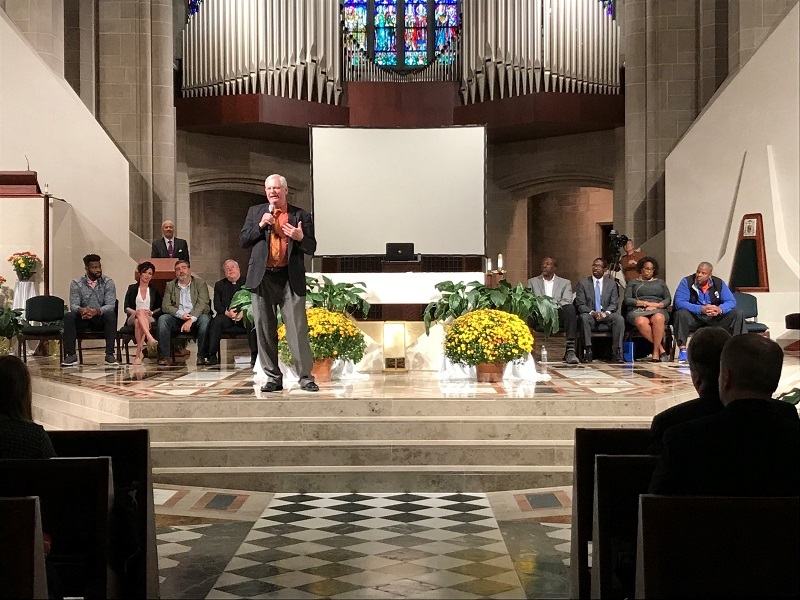 A panel of NFL celebrities and community leaders discussed the wide-ranging effects of the opioid epidemic. With stories and personal testimonies, they made the topic relevant for their young audience. Moderating the discussion was Huel Perkins from Fox 2 News Detroit. Panel members from the NFL Alumni Association included: Braylon Edwards, who played for the New York Jets, Seattle Seahawks, and the University of Michigan; Lomas Brown, former player for the Detroit Lions; and Tim Walton, President of NFL Alumni Players Association Detroit and NFL coach. Other panelists included Dave Bartek, Chief Executive Officer of Catholic Charities; Registered Nurse Megan Aubin of Meridian Health Services; Third Circuit Court Judge Karen Braxton; Carlton Akins of Team Wellness; and Jim Hudgens of New Paths Inc. Proceeds from the event benefited Catholic Charities of Southeast Michigan’s Mental Health and Substance Abuse Counseling ministry, as well as other community organizations dedicated to serving those affected by the opioid addiction crisis: Grace Centers of Hope, Metro East Corporation in Detroit, and Team Cares Inc.
Catholic Charities would like to thank our event sponsors Alliance Catholic Credit Union, Blue Cross Blue Shield of Michigan, Children’s Hospital of Michigan Foundation, Oakland Regional Hospital, Walgreens, and Weingartz. We would also like to thank those who provided lunches for the students — Subway and Breakaway Deli.